Going from passion to viable business is the first hurdle for a new entrepreneur. When a project is just a pipe dream or a hobby on the side, it’s easy to only see the positives. After all, those niggling day-to-day realities aren’t there and there’s no reliance on it for your sole income. But going full-time and embracing what is almost certainly going to be an extended period of negative cash inflows means meeting any other problems head on. This can be a daunting prospect for a new entrepreneur. Three London entrepreneurs currently attempting to make that leap are Jon Warshawsky, James Ross-Harris and Richard Warner who together form Blenheim Forge – purportedly the only manufacturer of chef knives in London. 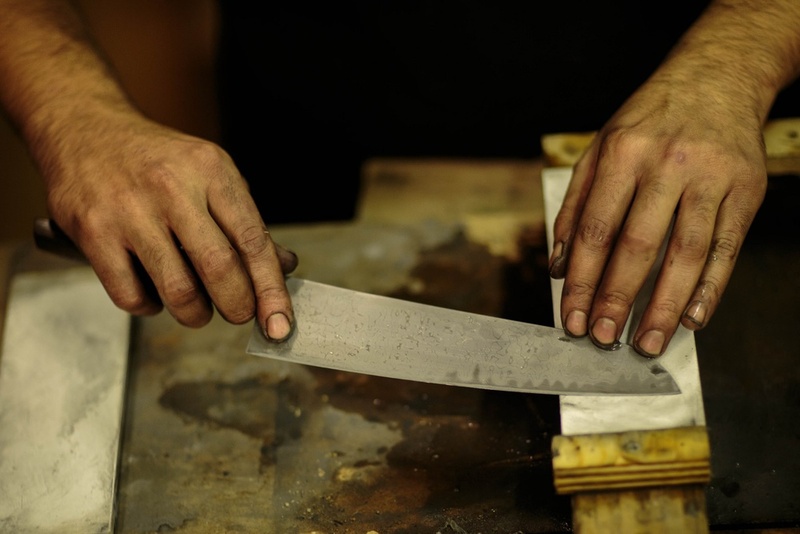 Not only that – Blenheim Forge is working with modern Damascus steel – a metal many smiths consider to be one of the most difficult to forge but with the ability to create strong, flexible and versatile bladed products. This is because the knives are created through addition and not subtraction – as mass produced knives would be, says Ross-Harris. Instead of taking a sheet, stamping out a pattern and paring it down to create an edge, as would be the case with many stainless steel knives, Blenheim’s knives are hammered into the correct shape – using compression to create the basis for an edge instead, he explains. This means that the finished product is stronger and more robust. In particular, it is difficult to maintain the consistency in heat required to work the metal, he adds. Each knife requires hours of tending to get to a usable point – and that doesn’t include the time required for crafting a handle or sharpening the edge.